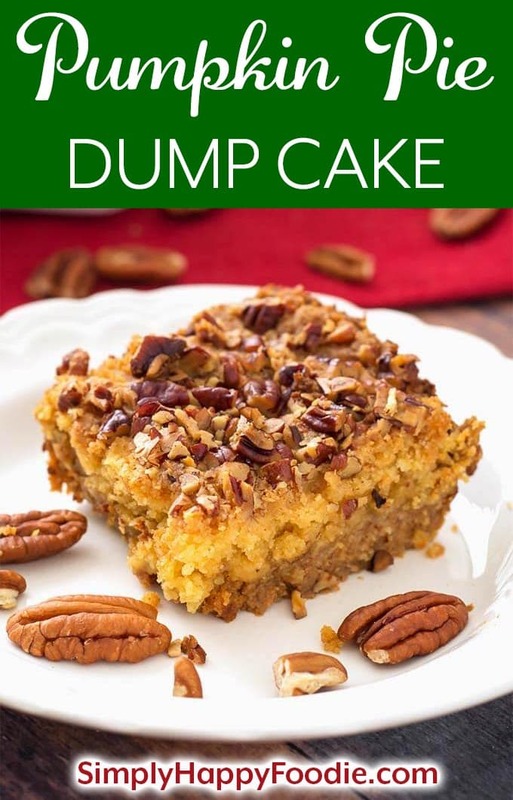 Pumpkin Pie Dump Cake is a scrumptious, easy dessert recipe that you can make the day before you need it, if you want to. This is a combination of a pumpkin pie recipe (without a crust), and a cake (without frosting)! One of my family’s favorite Thanksgiving dessert recipes. 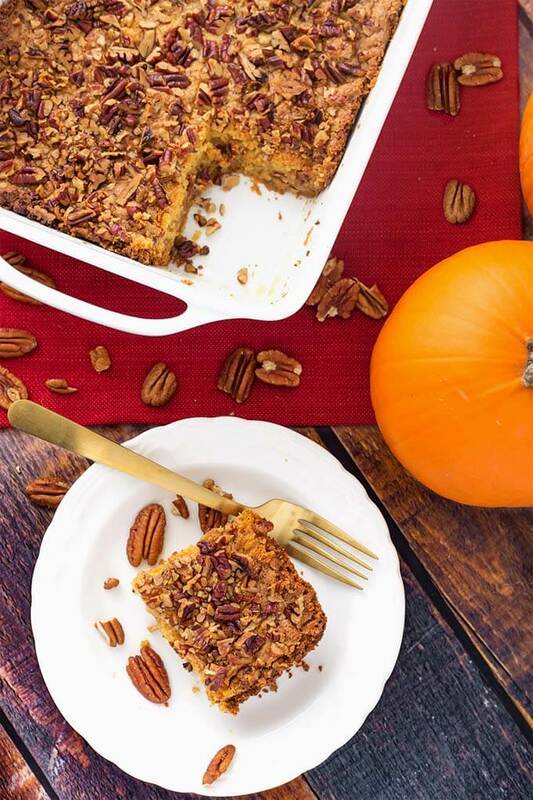 If you like pumpkin pie, then you will like this mashup Thanksgiving dessert recipe! It has the best part of the pumpkin pie, the filling. If that wasn’t delicious enough, it is topped with a rich, buttery layer of cake. Then topped with some crunchy pecans! This is so good! I love a dessert baked in my 9″x13″ baking dish! 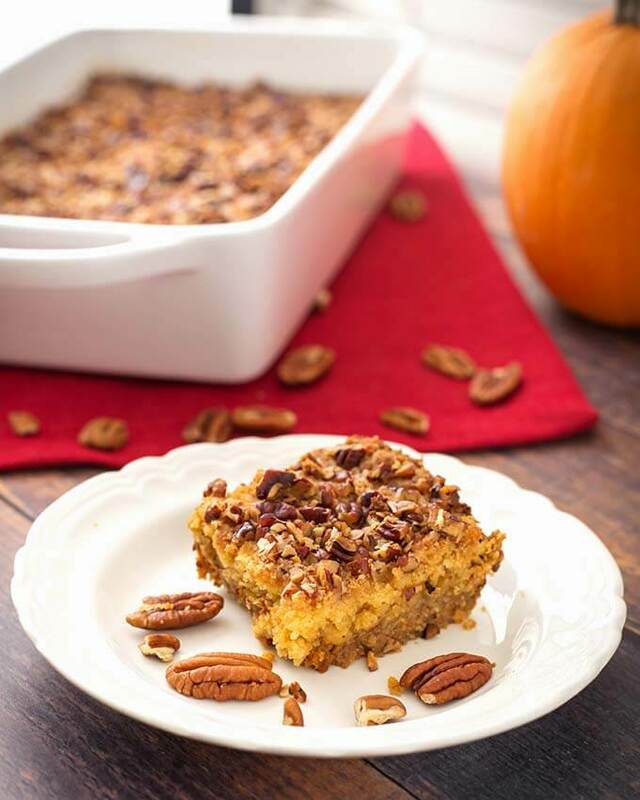 When you need to feed several people, this Pumpkin Pie Dump Cake is a great choice. 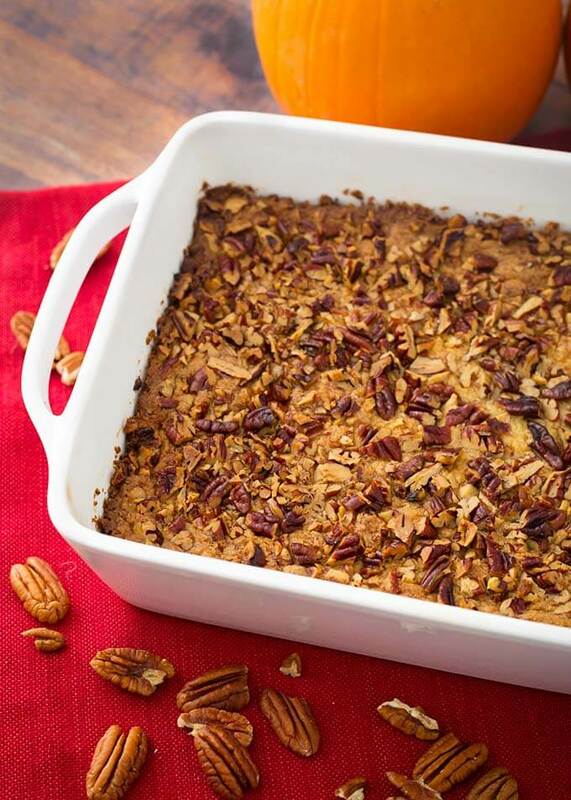 Since it is baked in a 9″x13″ baking dish, it can be cut to as many servings as you want. I usually serve 8 to 10 people with this recipe. 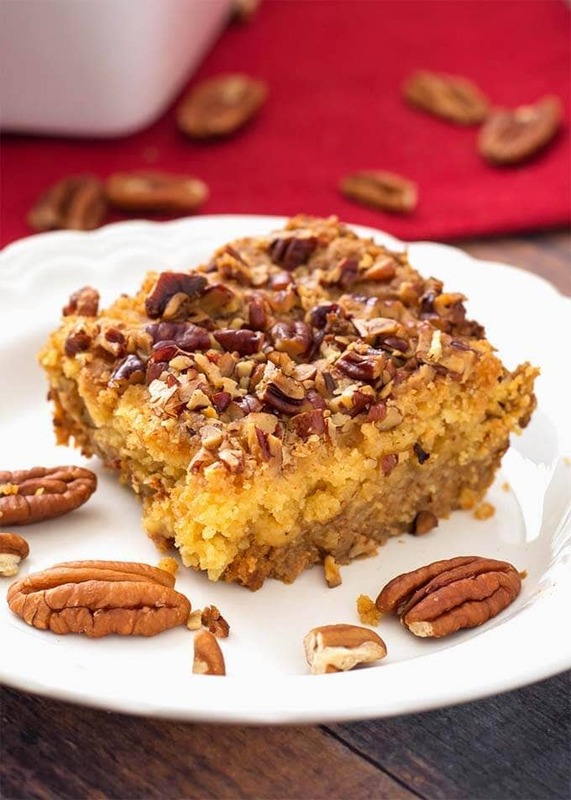 If you aren’t fond of pecans, try using walnuts, or almonds! If you are familiar with dump cake recipes, you may be wondering why I don’t have you melt the butter first, before pouring it over the cake mix. The answer is that I like it this way, but you can absolutely do the melted butter method if you want to. To those who are new to dump cakes, what this means is that instead of cutting the cold butter into the cake mix, you would spread the cake mix over the pumpkin mixture, then pour the melted butter over the cake mix, covering it completely. Then proceed with baking it. Happy Thanksgiving, and Happy Fall to all of you. I am SO THANKFUL that you like my recipes, and appreciate each and every one of you! 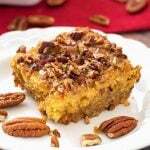 Pumpkin Pie Dump Cake is a scrumptious dessert recipe that you can make the day before you need it, if you want. This is a combination of a pumpkin pie recipe (without the crust), and a cake (without the frosting! One of my family's favorite Thanksgiving dessert recipes. Heat oven to 350° (F). Grease a 9"x13" baking dish (I like to use a baking spray). In a large mixing bow combine the pumpkin puree, evaporated milk, eggs, sugars, vanilla, cinnamon, ginger, pumpkin pie spice, nutmeg, and cloves. Mix well and pour into the greased 9"x13" baking dish. In a separate mixing bowl, add the cake mix and the cold butter pieces. Use a pastry cutter to cut the butter into the mix until the mixture appears crumbly (like small peas). Spread the cake mixture evenly over the pumpkin mixture in the baking dish. Sprinkle the chopped pecans over the mixture evenly. Bake at 350° (F) for 60 to 75 minutes, or until a knife inserted in the middle comes out clean. If you are familiar with dump cake recipes, you may be wondering why I don't have you melt the butter first, before pouring it over the cake mix. The answer is that I like it this way, but you can absolutely do the melted butter method if you want to. I brought this cake to a potluck at work and everyone loved it! That’s great, Brenda! Thank you!